Fabric sourcing is a crucial step in the design and manufacturing of your new line, but it can be overwhelming. With the wealth of information and the vast array of fabric sourcing vendors and fabrics, where do you even start? Not to mention the issues when it comes to fabric choices and budget. You will be happy to know that fabric sourcing doesn’t have to be scary, overwhelming, or even stressful. As long as you know the resources at your disposal and how best to utilize them, this can actually be a fun step in the design process. The best place to start when talking about fabric sourcing, especially for new designers is getting your head around the many different types of fabric sourcing vendors available to you. From retail stores to mills, there are plenty of options and they all come with pros and cons. It is all about finding the one that works best for you. The first thing you probably think of when you hear fabric sourcing or fabric shopping is the traditional retail fabric store, right? And you’re not wrong. When it comes to sewing a couple pieces or just finding inspiration, these are a great resource. However, when it comes to designing a collection, a retail fabric store like Mood Fabrics, may limit your options and the success of your line. The cons of choosing a retail vendor for fabric sourcing comes down to price and availability of yardage. 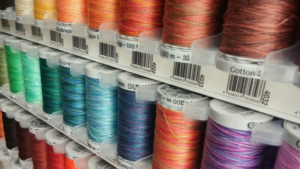 In relation to other vendors, your traditional fabric store can be pricey. When you are looking at price margins, the price point of a retail vendor just doesn’t add up. The other factor to consider is your needed yardage. Retail vendors can rarely supply more than 100 yards. So, if you fall in love with a fabric, use it and then need to produce more, you may find yourself stuck while you and the store attempt to find more. Online fabric stores are great. They have large warehouses of supplies, a wide variety of options, and product descriptions and searched make it easy to find what you want. Another advantage of sites like Organic Cotton Plus is the ability to get a lower price point per yard with larger orders. The disadvantage is that these price points are still pretty high. However, if you are planning to sell your line at a high enough price point, you could still make online fabric retailers work with your price margin. Jobbers are a great resource for both new and established designers when it comes to fabric sourcing. They work directly with millers and importers and essentially run around town to find the fabric you need. Thanks to low overhead costs, jobbers are able to charge a relatively minimal fee considering the amount of work they are doing for you. Working directly with fabric mills is a great way to get the fabric you need at a cost that will still allow you to meet your desired price margins. Essentially, the higher you go up in the supply chain the lower the cost, and fabric mills are at the top of that chain. The downside, particularly for new designers is that most fabric mills require a minimum order which can mean high overhead costs. If you’re just starting out, this may not be doable. Fabric converters are a great way to get the exact fabric you are looking for. Converters import or buy unprocessed or greige goods from fabric mills and finish them. The finishing process typically includes dying, printing, etc. Working with converters may be harder for new designers thanks to minimum orders similar to those you would find with a fabric mill. fabric you want at the price point you need. Their main job is to support you and you should use them as much as possible.